The other day we told you about a modification called R eminders + that allowed us to add reminders to the lock screen , today we see something similar but for the Notes, and in this case, for the notification center instead of the lock screen. There are people who like to take notes or reminders more accessible to not forget anything. WeeNotes for Notification Center will allow us to see our notes in the notification center, only see the first few words of the note, because it only shows three lines of text, if you want to see the entire note and we will have to press it opens on a black background as you can see in the image at right. The tweak is based on LockInfo and its many possibilities to place widgets on the lock screen and notification center, if you like and do not know LockInfo is a modification that I highly recommend, is one of those why people actually do the jailbreak, because they can not live without it. The problem with this is that kind of added bulky Notifications Center, and at the end we have no room for what really matters, notifications, that is what is created. 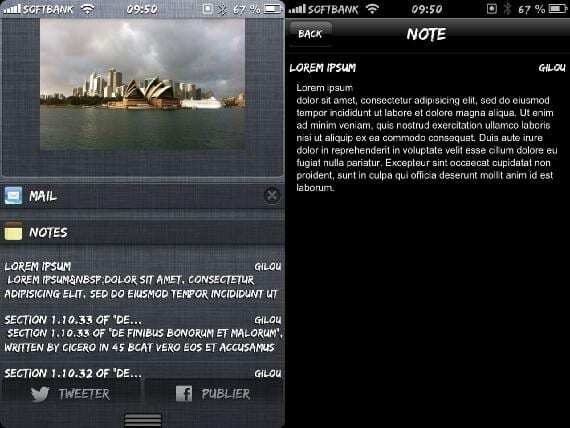 Article WeeNotes for Notification Center: Notes on Notification Center (Cydia) was originally published in News iPhone .